Hapag-Lloyd Cruises last week announced that the two pillars of its future development will be luxury cruising and expedition voyages, while at the same time it will be looking to grow these sectors by expanding in the English-speaking market. The newbuilding Europa 2, to be introduced in May 2013, and fleetmate of the existing Europa, will be aimed at the 5-star luxury sector. And, in addition to the existing expedition ships Hanseatic and Bremen, new growth opportunities will be sought in the expedition sector. Hapag-Lloyd Cruises is already known in German-speaking countries as one of the leading operators in the luxury and expedition sectors. And at the same time, the proposed expansion into international markets will go hand-in-hand with this focus. “By consistently focusing on these two pillars, we strive to enhance further our strength and our leading position as regards quality in these segments and at the same time we will address new markets“, explains Dr. Wolfgang Flägel, Managing Director of Hapag-Lloyd Cruises, who succeeds Sebastian Ahrens. The first English-language Europa 2 brochure is to be released this week. As a result of this new strategy, Hapag-Lloyd’s charter on the Columbus 2, which concentrates on the German-speaking four-star market, will not be extended when it expires in April 2014. 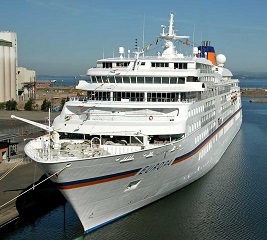 Hapag-Lloyd took over Columbus 2 this May and has been operating her under bareboat charter from Oceania Cruises, where she had been operated as the Insignia. Equally, today’s product is certainly one of the best in the cruise market and its attraction is not only the line’s great tradition, but also in its great attention to detail when it comes to service. As well, Hapag-Lloyd Cruises is one of the last lines to sell drinks at real duty-free prices and not the landside hotel prices that have been adopted by all other lines today except the all-inclusive ones.